Both cannot delete the item you are currently viewing. 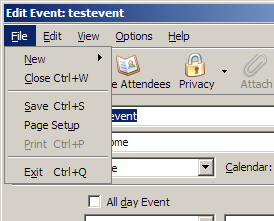 In Lightning (and I guess in Sunbird as well), when you open an event (or todo item) you cannot delete this very item from the menu or toolbar. There is simply no delete function. Only in the various calendar views, but not on the item itself. This annoys me, because here is exactly the place where you see and know most about the potential delete candidate... what better place to delete it ? Same in the email client on my Nokia 6233:Not that anything really works there... The 6233 does something I dubbed "POP over IMAP", since it uses IMAP as a technical protocol layer but only offers POP like features. There also, I cannot delete the mail I'm currently viewing. I have to go back to the inbox and delete it from there. Crappy.